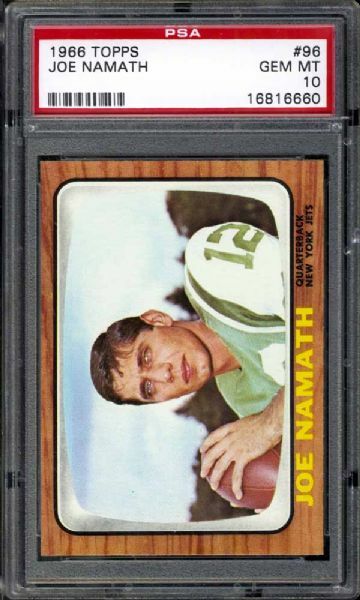 The iconic phrase “a picture is worth a thousand words” applies to a myriad of sports cards, but none more so then this absolutely remarkable 1966 Topps Gem Mint 10 Joe Namath marvel that at this pinnacle grade is unique to all of the remaining 550+ PSA graded specimens! Correct indeed, this breathtaking offering has managed to outdistance every other 1966 Topps Namath card, standing steadfastly alone at the “top of the charts”. Any single graded gem mint 10 example is ultra rare, let alone one that represents a Hall of Fame football quarterback whose popularity is equivalent to American legends such as Babe Ruth, Joe DiMaggio, Marilyn Monroe, and Elvis Presley, just to mention a few. Synonymous with this card’s unparalleled status as the “best of the rest” is Joe Namath’s legacy which far exceeds his statistical achievements. Joe “Willie” Namath’s guaranteed Super Bowl III victory over the mighty Baltimore Colts changed professional football forever, eventually leading to the official AFL and NFL merger as one National Football League consisting of an American and National Football Conference and earning Namath eternal immortality. Since his first appearance on an AFL football field, Namath gained the attention of the sports world via his flamboyant “off the field” lifestyle, dazzling white shoes and powerful right arm that produced a significant number of long touchdown passes. True, other quarterbacks have thrown more touchdowns, completed more passes and compiled a significant higher number of passing yards, but Namath’s incredible passing prowess and unquestionable leadership skills deserves a majority of the credit for two separate football leagues being united as one. His unique popularity continues to inspire serious football enthusiasts to pursue his most prized cardboard keepsakes, and only a handful imaginable could surpass the desirability of this perfect PSA 10 anomaly. Every aspect of this card more than sufficiently lives up to its elite expectations including a pristine portrait like Namath pose as the colorful quarterback prepares to toss another one of his clothesline passes. Uncharacteristically, the image is dead-on 50/50 centered between four immaculate wood grain hued borders with impeccable pin-point corners and razor sharp edging completing an unimaginable obverse side. The flipside print registration is likewise flawless, portraying the bold and crystal clear clarity consistent with its original production date. The most rewarding aspect of this sole PSA 10 masterpiece has to be the impeccable wood grain colored borders that, similar to the 1962 Topps baseball issue, are highly condition sensitive with most remaining specimens exhibiting edge chipping/flaking. Substantiating this notion is PSA’s “pop” chart indicating that a paltry 17 or 0.1% of the total 12,000+ encapsulated 1966 Topps subjects have managed to achieve the exalted Gem Mint 10 assessment. 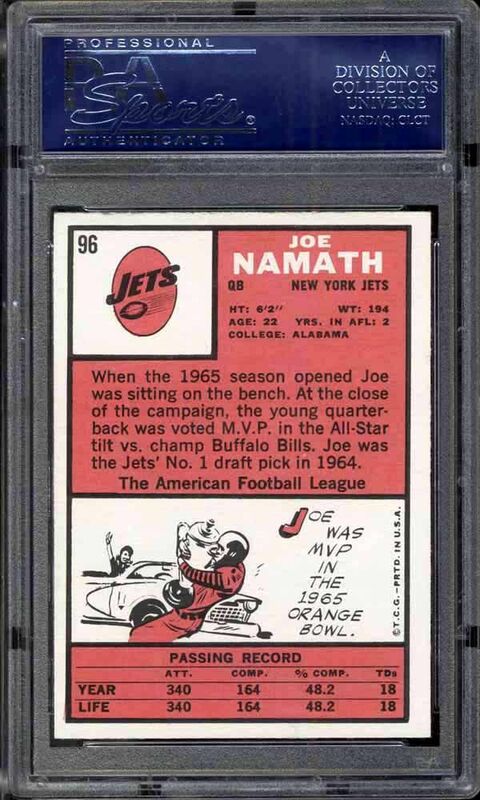 Irrefutably, the visual brilliance and PSA 10 assessment of this “one of a kind” offering qualifies this Joe Namath keepsake as his finest 1966 Topps specimen and one of the grandest football cards on the planet! Auction closed on Saturday, November 27, 2010.